Every single time I see that the Blogger's Quilt Festival is going on, I mean to enter something. But then I forget until the deadline passes. And I almost did it again this time! But now that the sugar-high Halloween bats have finally crashed, I'm entering my scrappy Japanese x&+ quilt at the last minute. It's hands down my favorite quilt I've ever made. It's made entirely of scraps that have been accumulating since I began sewing at all, way before I made my first quilt last year. Each one has a sewing memory tied to it. You can read a little more about it in my original post here. 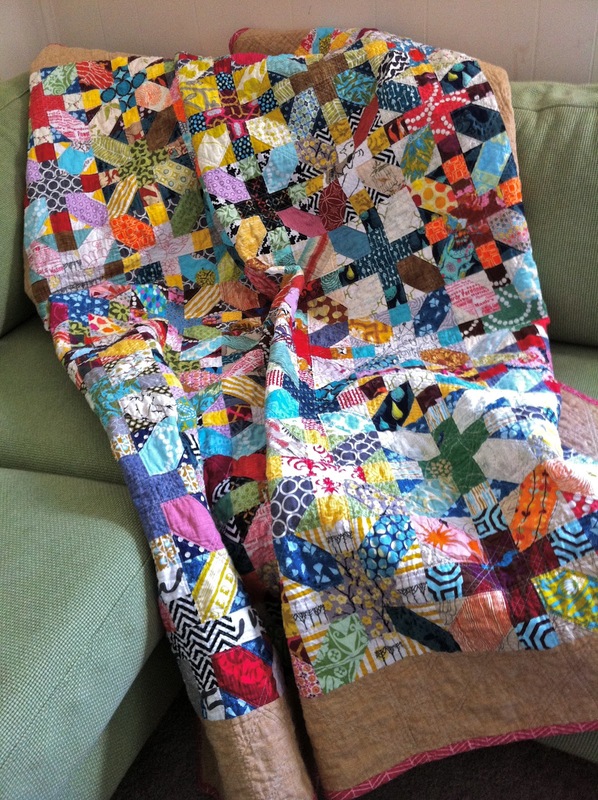 This quilt has seen A LOT of enjoyment and cuddling since I finished it in September! Special Techniques: Used Amy's x and + block tutorial, made from only scraps. Quilted by me on my DSM with heavy straight line quilting. You can now go here to nominate mine in the scrap quilt category. It's #599. Thanks! 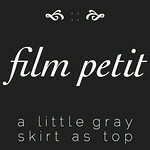 Make sure to check out the festival post, for about a gazillion inspiring quilts. This quilt is so beautiful! I love it. Wonderful. I haven't met an X and Y quilt that I didn't like yet! I've been wanting to have a scrappy project to pick up and put down when I'm in the mood. This might be it! This quilt is so perfect, Jessica! Good luck with the contest! how did i miss this post yesterday? 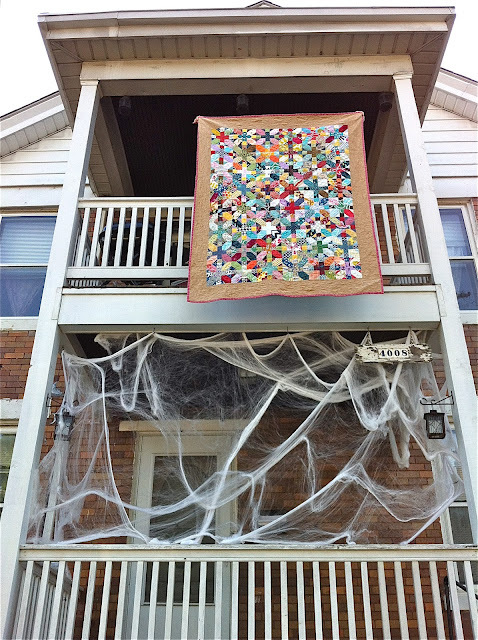 i just saw your quilt on the linky...adding it to my nomination list now! 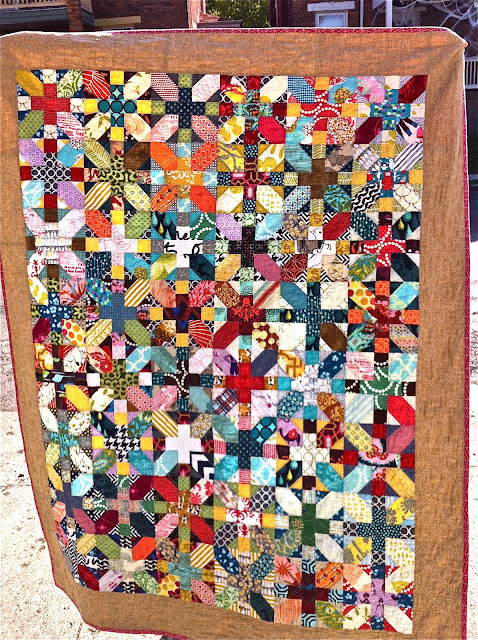 This is a great scrap quilt! So bright and pretty... The border anchors it so nicely. Love your scrap quilt. I have amy's tutorial marked and it is on my list of quilts to make. It's gorgeous! one of the prettiest scrap quilts I have seen! I'm so glad you are entering this quilt. It is so amazing, I really hope you win! I love this quilt, Jessica! Good luck! This really IS beautiful - one of my very fav x and + quilts! I love love this quilt, Jessica! This quilt is sooooo gorgeous. Just saw it in the festival! Best of luck!!! what a bright fun quilt. Doesn't look like you've only been quilting for a year. Oooh! I love your quilt! Scraps make the BEST quilts! THAT IS SO pretty! What an awesome awesome quilt! Beautiful!